Puca Pucara houses enclosures such as inner squares, canals, aqueducts, baths and a well-known ancient road, which should have been part of the network of Inca roads known as Qhapaq Ñan; The buildings are built with rocks of different sizes (small and medium). Puca Pucara presents the surface of the rocks very uneven, compared to other archaeological sites. The name Puca Pucara means red fort , and is due to the location of the archaeological group and to the existence of some semi-circular enclosure; Red is the color of the earth. The name of this place was used from the twentieth century. The archaeological site of Puca Pucara is situated at the top of the road that leads to Pisaq, about 7 km. Of the imperial city of Cusco and its height reaches 3,580 meters above sea level. The constructors of the Inca Civilization built three walls of irregular plant, that establish the three levels of the site. The first wall presents a sinuous path, which carefully avoids cutting the protruding rocks. From the north end at the back of the outer wall, you can find a total of 6 rooms of different sizes; Arranged irregularly in order to avoid touching the stones that make up the wall. To the west you will find a high place of trapezoidal form that can be entered from an outside staircase. In ancient times the square was surrounded by buildings on two sides. The 9 rooms regularly laid out in this place do not appear to have been in any way fortified enclosures. The second wall is located around the central elevation. These first two walls, have wide platforms to the east and south of the site. At the back of the second wall, it is possible to find 3 different rooms of the typical Inca architecture, since 2 of them do not have the common rectangular but trapezoidal floor. The third wall is surrounding the summit and there is no trace of the buildings that could exist in this place. The buildings were built with stones of many sizes between medium and small, the surface of the rocks is very uneven compared to other archaeological remains of the Inca civilization. The urban layout presents an adequate and functional layout. 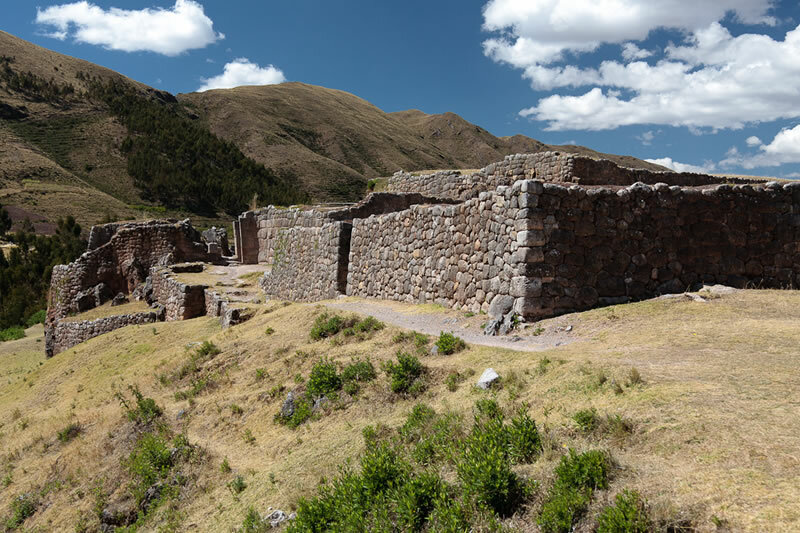 According to some chroniclers, in pre-Hispanic times, when the Inca prepared to visit the baths located in Tambomachay, his entourage composed of soldiers and dancers, they remained in Puca Pucara , which simultaneously operated as barracks and tambo(hostel). Rumors exist about a chincana (tunnel), supposed to function as a channel of communication between these 2 Inca towns. The function of this place is uncertain; The presence of the road may lead one to think that it was a tambo(hostel). And although it could be, its structure does not correspond to the buildings that were commonly constructed along the Inca roads. Perhaps it was a settlement for the soldiers who protected the Incan ruler, while he spent a few days of rest in the baths of Tambomachay; Or maybe it was a hunting ground for the Incas. The answers to these questions have not yet been resolved. The archaeological site of Puca Pucara welcomes visitors every day of the week (from Monday to Sunday) from 7am to 6pm.